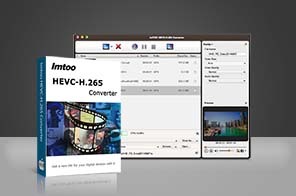 ImTOO HEVC-H.265 Converter for Mac, a best convertion tool for HEVC/H.265 movie, can convert almost all popular video to HEVC/H.265, and vice verser on Mac. With this HEVC Converter or H.265 Converter, you can also extract audio and picture from videos for Mac user. It also can support iOS Devices(iPhone, iPad, iPhone) and Android phones. Mac HEVC/H.265 to Video Converte;- Convert HEVC/H.265 to other videos, e.g. MPEG, MP4, H.264/MPEG-4 AVC, H.265/HEVC, MPEG-4, MKV, TS etc. on Mac. Convert almost all popular video to HEVC/H.265 formats, such as MPEG, MP4, MKV, H.264/MPEG-4, H.265/HEVC, MOV, H.264 etc. Convert HEVC/H.265 to other videos, e.g. MPEG, MP4, H.264/MPEG-4 AVC, H.265/HEVC, MPEG-4, MKV, TS etc. Capture images from videos and save them as JPG, PNG, GIF, BMP. Convert popular video formats; convert audio formats such as MP3, WMA, WAV, M4A, AAC. Support batch conversion and let you convert multiple video and audio files at a time with one click. Fully support various multimedia devices including iPod, iPhone, iPad, and mobile phones. Enables you to transfer the outputted files to iPod, iPhone and PSP directly after converting. Support HEVC/H.265 video decoding and encoding. Split a large video file into several smaller; convert any part of your video by setting the start time and duration. Adjust video and audio parameters to get the best effects, such as resolution, bit rate, frame rate, codec, quality. Export more than one file in the same content only once by choosing multiple profiles for one source file. The built-in Bitrate Calculator gives you the ability to get the output file size you want. Intuitive profile list classified by device type lets you find the profile you want more quickly and easily. The snapshot function enables you to capture pictures from videos while previewing video in the built-in resizable player. Available in English, German, French, Japanese, Spanish and Chinese interface languages. Great audio file converter can convert video/audio files to common audio formats, even burn to CDs; convert CDs to audio formats.